The FrogWatch, USA, National Zoo chapter is entering its seventh season of FrogWatch USA at the zoo. To date it has monitored 75 sites in DC, Maryland, Virginia, West Virginia, and Maine and has submitted almost 2,000 frog call observations. 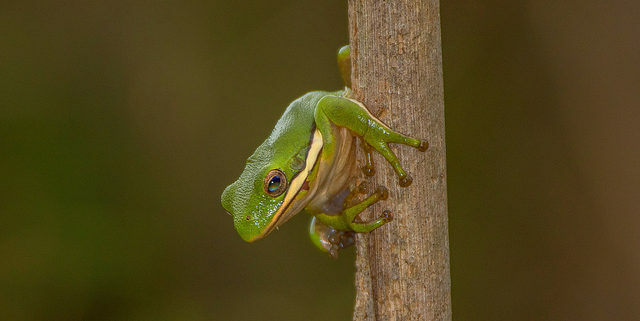 FrogWatch tracks frog populations throughout the United States. Participants will choose a monitoring site that is easily accessible and close to where they live or work to listen to frogs that are calling throughout the warmer months. The three indoor trainings help orient people with the frogs that are in the DC-metro area and their calls. Content is the same, so chose one training that fits your schedule. If you are interested please contact Matt Neff: neffm@si.edu. Huntley Meadows Park, 3701 Lockheed Boulevard, Alexandria, VA has two opportunities of greatest need at the moment. One of them may be right for you. Greet and orient visitors as the Volunteer on Duty (VOD). It’s hugely important and lots of fun. These folks at the front desk orient visitors and do a lot of interaction. They get to hear firsthand all the creature sightings from visitors, and introduce new visitors to the park and everything it has to offer. We’re short especially on Monday and Friday afternoons at the moment. The School Program Leader job is a blast as well! This is a weekday morning, ~9:30AM to 12:30 pm commitment – we ask for a minimum of 10 programs per year, spread through spring and fall. Training is very much “on the job” and there is a co-leading transition before folks are asked to lead hikes through the wetland on their own. For more information, contact Halley Johnson, Alexandra.Johnson@fairfaxcounty.gov or see the links below. All volunteers need to apply through the online system and go through an interview process to ensure that everyone is aware of expectations and make sure they’re in the right place for their goals and needs. Fairfax Master Naturalists should record their service hours as E111: FCPA Nature Center Visitor Information Desk for Volunteer on Duty or as E110: FCPA Nature Program for the school programs. Please sign up to volunteer by 31 March 2019. The bluebells are starting to bloom at Riverbend Park! This means spring is around the corner …and so is the Bluebell Festival! The Bluebell Festival is one of Riverbend’s biggest events of the year and a perfect opportunity to celebrate Riverbend and promote its preservation goals. Wonderful volunteers are needed to ensure the event is a success! Are you interested in becoming a Riverbend Park volunteer? Do you want to learn more about habitat restoration, nature/outdoor educational programs, or how to support the park? Join us on April 13th at our upcoming Volunteer Orientation event from 11AM-1:30PM. Volunteers will learn about Riverbend’s volunteer program, available opportunities, and upcoming events and then participate in a hands-on restoration project or interactive training to get started! Note: this is the last orientation event until the fall! If you are interested, but cannot attend let Valeria know. Become a School Programs Lead Volunteer! Riverbend Park is in search of motivated naturalists interested in helping to educate local students about nature, culture, and history through our field trip programs! School programs run on weekday mornings during Spring and Fall. Topics include soils, Native American history, ecology/wildlife, watershed science, geology, and more! Become a Programs Assistant Volunteer! We have Program Assistant opportunities for outdoor rec programs, nature programs, scout programs, and summer programs. These will be included at the Volunteer Orientation on April, 13th! Whether you have a passion for hiking, birding, fishing, canoeing, kayaking, trees, wildlife, campfires, rocks, etc… we’ve got an opportunity for you! Fairfax Master Naturalists: record your hours as E110: FCPA Nature Programs. The Mason Neck State Park Eagle Festival on Saturday, May 11 is the Park’s biggest event of the year. More than 20 environmentally-oriented organizations will showcase interactive exhibits. We’ll have a full day of programs, including shows on reptiles and raptors, live music, pony rides, a tent for children’s activities and more. Last year more than 4000 people attended this great event. The Friends of Mason Neck State Park covers all the expenses for the Festival, as well as providing the volunteers that help to make the event go smoothly. Would you like to help us out? Send an email to Volunteer for Eagle Festival and we’ll find you a job that you’ll enjoy. https://fairfaxmasternaturalists.org/wp-content/uploads/2019/03/unnamed-e1551655512152.jpg 931 1881 Janet Quinn https://fairfaxmasternaturalists.org/wp-content/uploads/2017/02/FMN-Logo-300x222-1-300x222.png Janet Quinn2019-03-03 23:25:512019-03-03 23:25:51Volunteers Needed to Help with the May 11 Eagle Festival! CaterpillarsCount! (Citizen Science Service Code C254) is part of a multi-year, multi-site National Science Foundation-funded study to determine whether seasonal activity of plants, insects, and birds are all responding in the same way to climate change. The lead universities for the study are University of North Carolina, Georgetown University, and University of Connecticut. Figure 1 maps the 73 sites around the Eastern U.S. that collected data in 2018. The paper that was the impetus for the project is “Increasing phenological asynchrony between spring green-up and arrival of migratory birds”, which appeared in Nature’s Scientific Reports, Vol. 7, in 2017. Phenology is a branch of science dealing with the relations between climate and periodic biological phenomena (such as bird migration or plant flowering). 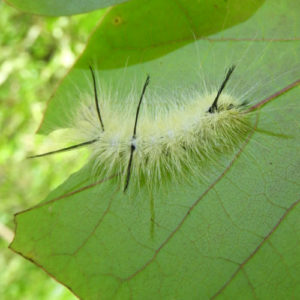 At each site, volunteer citizen scientists count caterpillars and other arthropods on a specific collection of 50 leaves on each of 10 trees during the growing season (May-August). (50 is an arbitrary number intended to be a balance between getting enough data and not creating an overwhelming data collection chore.) These counts will be repeated over several years to look for trends. With 73 sites, there is no way this data could be collected without citizen scientists, hence the participation of naturalists like us. Researchers at the universities analyze the data. For the Fairfax County site, the selected trees are in the Walker Nature Center (WNC) in Reston. WNC Director, Katie Shaw, is the site manager. I am the lead data collector, assisted by two other FMN members, Kim Schauer and Claudia Thompson-Deahl. Elise Larsen of Georgetown University has been our point of contact with the national CaterpillarsCount! project. In 2018, we conducted 140 surveys on 14 different dates, observing a total of 500 arthropods, including 13 caterpillars, which were present on 9.29% of surveys. (A “survey” observes the 50 leaves of one tree.) Nationally, the top 10 sites had caterpillars present in average of 5.32% of surveys, so our site looks good from this perspective. One of the prettiest caterpillars we found was the American dagger moth caterpillar, Acronicta americana, shown in Figure 2. We also observed fall webworm moth caterpillars, geometer moth caterpillars, and others that we could not identify. Among the other arthropods we observed were debris-carrying lacewing larvae, daddy longlegs, beetle larvae, and sylvan jumping spiders. Because caterpillars are a major source of food for nestlings of migratory birds, we are especially interested in the timing of caterpillar availability. Caterpillar phenology (e.g., lifecycle events) at the WNC site is shown in the Figure 3. Caterpillar occurrence peaked at 36.36% of surveys on August 19. Note that August 19 is late to provide a food source for nestlings. My conjecture for this lateness is that the insects usually responsible for caterpillars in the spring are becoming rarer (along with most flying insects; see More than 75 Percent Decline over 27 Years in Total Flying Insect Biomass in Protected Areas) and fall insects do not suffer as much predation by birds. No conclusions can be suggested yet about the effect of climate change, since the sturdy will need to go on for several years to obtain comparative data. It is interesting that the “caterpillar” we observed most often is not a caterpillar at all. By definition, caterpillars are in the Order Lepidoptera (butterflies and moths), whereas the most observed larvae were dogwood sawfly larvae, Macremphytus testaceus, in the Order Hymenoptera (bees, wasps and ants). 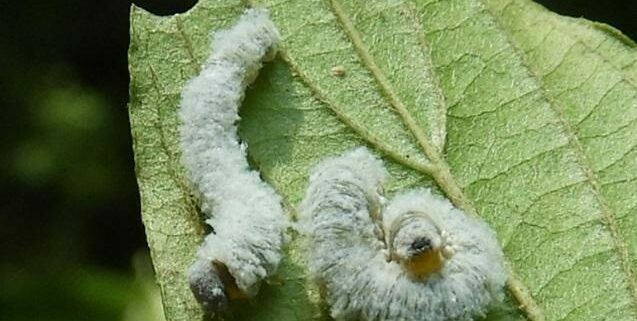 Two of these larvae are shown in Figure 4. The larvae were so numerous that they defoliated the tree, a Red Osier dogwood. One benefit in participating in CaterpillarsCount! is learning to identify all sorts of arthropods. There is an online training course and field guide for this purpose. As a novice entomologist, I found both the opportunity and guidance valuable. One unexpected benefit is the opportunity to observe nature surrounding the survey sites in a leisurely way, closely, and repeatedly. I noticed animals that I missed on other visits to WNC, such as tadpoles growing legs, a Northern water snake sunning on the rocks, a grey catbird taking a bath, an American rubyspot damselfly, and a violet dancer damselfly. The project could use additional volunteers this year and in the future. New volunteers could establish a new survey site or help with the WNC site. Training and support are provided. Please join me at the Walker Nature Center on April 23 for a discussion of the project. Elise Larsen will present with me. The talk counts for continuing education credits. Elise Larsen, PhD, Biology, University of Maryland 2013. Post Doc, Georgetown University, 2013 – present. Co-investigator on CaterpillarsCount! Don Coram, PhD, Mathematics, University of Wisconsin, 1985. Graduate, Fairfax Master Naturalist 2016, certified 2017. Wolf Trap National Park for the Performing Arts, in conjunction with the Friends of Wolf Trap (FOWT) and Scouts BSA Troop 55 (Great Falls, VA) sponsors a camp out for Fairfax County 5th & 6th graders in the spring and fall each year. The campout helps campers learn new skills, demonstrate that outdoor activities can be fun, teaches them about different aspects of nature and fosters a meaningful connection to the natural world. This is an opportunity for Fairfax Master Naturalists to help youth learn to become comfortable with the outdoors, have fun and build confidence, while not venturing too far from home. This is also a great way for parents to learn to become more comfortable that their child can thrive independently. 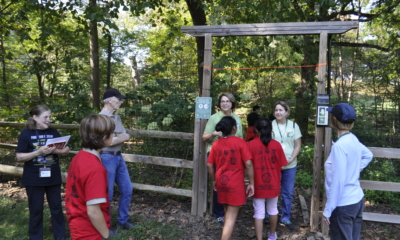 Fairfax Master Naturalists should refer to Project E248 in the Service Catalog for additional information on the program and participation requirements. Want to become a Riverbend Park volunteer? Learn about our upcoming opportunities, projects, and events and get started on your training with a hands-on project! Wildlife Camera Monitor NEW – Help us set up & track wildlife cams throughout the park and review footage for some action! Bluebell Festival on April 6th! https://fairfaxmasternaturalists.org/wp-content/uploads/2018/02/1_2017.9.23-FMN_Riverbend-Ana-Kaahanui_150817-01-e1548550798535.jpg 281 500 Marilyn Kupetz https://fairfaxmasternaturalists.org/wp-content/uploads/2017/02/FMN-Logo-300x222-1-300x222.png Marilyn Kupetz2019-02-27 02:49:582019-02-27 02:49:58Want to become a Riverbend Park volunteer? Each of these projects is on the FMN Service Project Calendar and count toward your FMN hours. Assist a naturalist with a salute to native animals that have real adaptations that rival the author’s fanciful creations. Contact Fiona Davies, fiona.davies@fairfaxcounty.gov or 703-941-1065. The Alice Ferguson Foundation is sponsoring the Potomac Watershed Cleanup on Saturday, April 13. Join the 31st Annual Potomac River Watershed Cleanup. The official date is Saturday, April 13, however, there will be cleanups throughout the entire month of April. The Annual Potomac River Watershed Cleanup is the largest regional event of its kind, and the Cleanup aims to engage citizens and community leaders and to generates momentum for change. The Friends of Accotink Creek website has information about Accotink Creek watershed cleanups on weekends, April 5 through May 11. This project is eligible for FMN service credit. As urban development in Northern Virginia continues to accelerate, the management of open spaces becomes more important than ever. Wolf Trap National Park for the Performing Arts, which encompasses more than 130 acres with 2.7 miles of trails, forests, native gardens, streams and a pond, contains important natural, recreational and historical resources for the community. 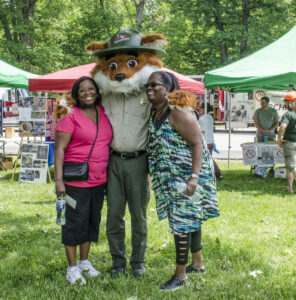 As a not-for-profit organization, the Friends of Wolf Trap (FOWT) contributes to community awareness and assists the National Park Service with providing educational programs, recreation, and preservation through centralized volunteer efforts. The FOWT are interested in increasing involvement from Fairfax Master Naturalist members in conducting citizen science projects and promoting the Park’s natural resources to the public. Sunday, April 7, 2019 (10:00 am to noon): iNaturalist Training and Hike at Wolf Trap National Park for the Performing Arts; Using iNaturalist to document and learn about nature is easy! Learn how, then participate in #CityNatureChallenge April 26-29. 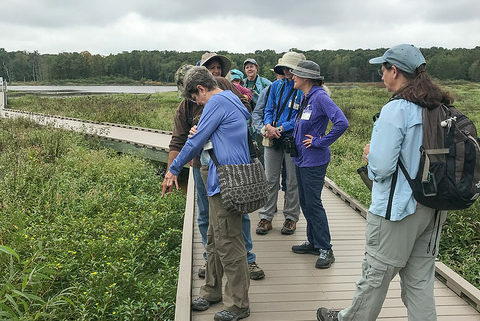 In preparation for the 2019 City Nature Challenge, please join Deborah Barber, Director of Land Management from The Nature Conservancy, who will provide brief ‘classroom’ instruction in using the iNaturalist app before leading the group through the Park’s trails and gardens to obtain practical field experience using the app. Be sure you have a fully charged smart phone and have already downloaded and signed in to the app.